How Much Do Restaurants Markup Their Wines By The Glass? My wife and I were out for a quick bite and a glass of wine last week and I was shocked when I learned that the $14 glass of Chardonnay wine I purchased came from a bottle of wine that cost the restaurant about $16. I thought the restaurant markups for a bottle of wine were steep, this was ridiculous. Unless I’m in an unusually high-end restaurant where I might expect to pay that much for a glass of wine from a really expensive bottle of wine, I usually see prices in the $7 to $10 range. What I have learned since researching this question of wine by the glass markups is those wines in the higher end restaurants are probably not coming from really expensive wines and the lesser priced wines, that $7 -$10 per glass, are coming from wines cheaper than I expected. Of course the price of wine by the glass is going to vary depending on where you live, the type of restaurant you are in, competition, etc., but I’m writing in generalities. There will be exceptions to everything I post here but from what I’ve learned in my research and speaking with a couple of professional restaurateurs, this is close to the norm. So when I returned home from this dinner and my one glass of $14 Raeburn Chardonnay that I later learned was from a bottle that cost the restaurant around $16, I was annoyed and wrote about it on a FaceBook group I belong to. A few of the responses were agreeing with me but then Chris, a general manager from a local restaurant, responded with the restaurant’s point of view and it really opened my eyes. I’m not saying I agree with everything Chris is selling to justify the other side of the story, but he sure makes a convincing argument and one I have to respect. I may not like what he has to say about wine by the glass markups, but it takes a little of the sting off my feelings towards restaurants and their charging methods. What I’m trying to explain or justify to myself is there are at least two sides to this argument. If I don’t want to pay up for that individual glass of wine, I have alternatives. I can choose NOT order wine and go with water. I can order ice tea and pay $3 for a beverage that is probably costing them less than 25 cents per glass. How about a nice cold draft beer? I’ll be paying $4 – $6 for a pint that costs the bar/restaurant about 75 cents. Now that’s a markup that I don’t think to complain about. But I do want that glass or two of wine with my meal and so does my wife. How can I ever justify paying so much per glass? Enter Chris from above and I have the other side of the story. Chris – For what it’s worth, most restaurants buy restaurant only brands for by the glass wine for this exact issue. A good alcohol cost is 20% which implies that you charge 5x your cost. A Miller lite bottle costs me $.76 and we generally charge $4. Same goes for wine. With 4 glasses in a bottle you typically charge the bottle price for a glass. This skews a bit as you get into more expensive bottles, but at most to a 33% cost. When you’re getting a well valued glass it’s either a restaurant only label, vintage or the restaurant is losing money. Me – What if we are talking about a $40 bottle of wine? Are you saying the cost per glass will be $30 – $40? Chris – I’d probably charge $20-$25/glass. That said I would never pour a $40 bottle by the glass for that exact reason. In addition, you’d ruin the integrity of the bottle once it’s open for a few hours, so it’s really pointless. You can decant a red and let it sit for a bit, but unless you sell it that night you might as well drink it yourself. In typical by the glass wine, you worry a lot less about the wine turning since the attributes of that particular wine are typically less pronounced and thus less sensitive. Me – I didn’t know that charging the cost of the bottle per glass is the accepted way in restaurants today. Thanks for sharing that tidbit. Where I think it may hurt a restaurant is that second glass. If they charged $10 – $11 per glass, I’m sure my wife and I would have had that second glass each, not at $14 especially when there were very few alternatives on the list. Do restaurants figure most customers are only going to purchase one glass each or do they estimate more when doing their budget estimates? Chris – At the end of the day whether you have 1 glass or 10 glasses, the volume on consumption doesn’t skew the cost or margin that a restaurant makes on each sale. We price items based on an individual sale. If sales are high, certainly there is more room for items to not meet cost with less of an impact to your overall beverage cost. To the contrary, when sales are lower, each item you sell above your target cost will drive that overall beverage cost up. So a glass of wine that I run a 40% cost on, say an $11 glass from a $25 retail bottle, my overall beverage cost slides up every glass that I sell. It’s not even worth putting it on the menu. The general public tends to see restaurants as this large conglomerate with beaucoup bucks. The reality is that most restaurants work on incredibly slim margins, if they turn a profit at all. 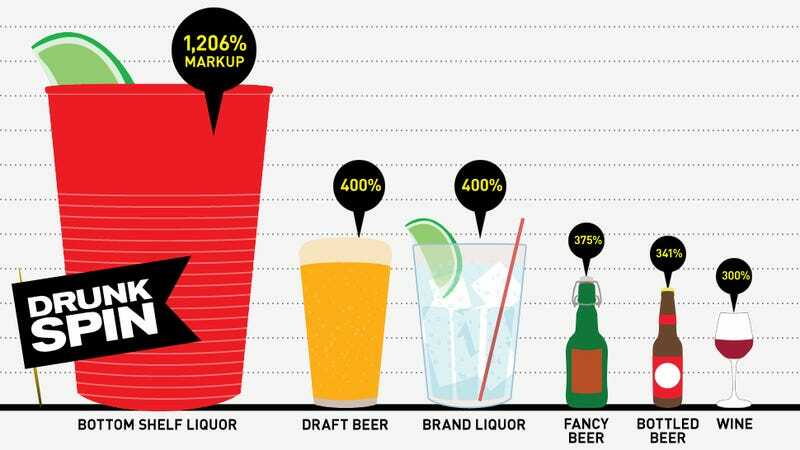 A 30% beverage cost would sink any restaurant. You have to remember that you are not paying just for the liquid. You are paying for a portion of the glass its served in, the table that glass rests on, the napkin, the server, the bartender, the electricity, the heat, the rent, the list goes on and on and on. The alternative is we can short pour and squeeze 5 glasses out of a bottle, but generally that is met with more contempt than a higher priced glass. Its funny that it always comes up in the conversation of wine when you actually pay much higher margins on beer/liquor. A bottle of Grey Goose costs me roughly $30. I get 21 shots out of a bottle assuming some waste. Industry standard is $8 for a single pour Goose drink. So I make $168 on that $30 bottle, which is a 20% cost. But no one complains about that. Always interesting to me what strikes a chord in this wonderful business I so dearly love! We are lucky to have many fine BYOB (Bring Your Own Bottle) restaurants in our area. Some have been around for years so I wondered how these restaurants can survive without selling liquor at high margins. So I asked another professional, my friend Chef David Nelson, how he thinks the BYOB’s can stay in business without the extra revenue generated by wine, beer and liquors sales. He explained to me that there are several costs BYOBs don’t have to deal with that restaurants with liquor licenses do. For example, let’s just start with the cost of a liquor license. The cost of a liquor license depends on the state you are in and the town or city you want to open your establishment. In Pennsylvania, a liquor license can set you back $75,000 to $80,000 in Pittsburgh and as high as $250,000 in Butler County in Western Pennsylvania. Then depending on what type of license you are trying to obtain, tavern, beer & wine, restaurant, brewpub or retail liquor store, the prices will vary. The cost of the liquor license may not be figured into every glass of wine sold but the owner of a restaurant needs to factor in that cost when deciding to go with a liquor license or go the BYOB route. You also don’t need to hire bartenders in a BYOB. You’ll need to train your wait staff to open a bottle of wine at the table but it won’t cost you for more employees. Then there is inventory. If you are going to have a wine list (another cost) you need to have an inventory of wines that’s can cost thousands of dollars. If you have more expensive wines that need to be stored at precise temperatures and humidity, well, there’s the cost of building a wine storage unit. You need to factor in the higher costs for insurance associated with a liquor license. Because selling alcohol can be associated with more risk, additional liability insurance in some states is a must and in others, just a prudent business decision. Again, another cost a BYOB restaurant doesn’t have to deal with. OK, I’m still not happy about paying $14 per glass of wine but I now have a better understanding of where some of the markups are going and how they help a restaurant survive. I also know that no one is forcing me to drink a glass of wine when dining out and there are alternatives, most of them likely to have even bigger markups that I don’t seem to care that much about. I have the option of only going to BYOB restaurants but we all know that’s not always a possibility and very limiting. There are times you want to try something new or have dinner with friends who choose a non BYOB establishment. I may not like some of the prices I see out there but I feel better with this knowledge and am going to promise my wife that I won’t complain next time we go out for dinner.